Bluegrass Pundit: Agriculture Department may base dietary guideline on climate change, not healthy eating? Agriculture Department may base dietary guideline on climate change, not healthy eating? Climate change is not a science thing. It's a religious thing. For years, the government has been issuing guidelines about healthy eating choices. Now, a panel that advises the Agriculture Department is ready to recommend that you be told not only what foods are better for your own health, but for the environment as well. 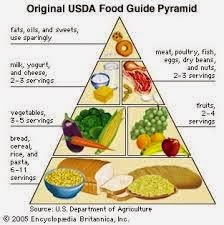 That means that when the latest version of the government’s dietary guidelines comes out, it may push even harder than it has in recent years for people to choose more fruits, vegetables, nuts, whole grains and other plant-based foods — at the expense of meat. The advisory panel has been discussing the idea of sustainability in public meetings, indicating that its recommendations, expected early this year, may address the environment. A draft recommendation circulated last month said a sustainable diet helps ensure food access for both the current population and future generations.